The three Nikkor FX lenses that need a refresh the most include two of Nikon’s biggest sellers and an old Nikkor lens that competes with a better Sigma alternative. Probably Nikon’s best selling lens is the second of what is known as the “holy trinity” of lenses for professional photographers, the Nikkor 24-70 f./2.8G ED. This lens was first produced in 2007 and is priced at about $1900. It is remains a great lens and a favorite “standard” lens for professionals, but it does not offer vibration reduction. Tamron introduced a strong competitor with its SP 24-70mm F/2.8 Di VC USD (Model A007) announced in February 2012. It has received strong reviews, including the Gold Award from DPReview for the quality of its optics and fast autofocus. Most importantly, the Tamron offers image stabilization and the lens is priced at $850, half the price of its older Nikkor competitor without image stabilization. The second Nikkor lens most in need of a refresh is the 105mm f./2.8G IF-ED VR Micro. While Nikon refreshed its 60mm f./2.8 VR micro in 2009, the 105mm was introduced in 2006. While it has excellent optics, the vibration reduction is dated. Although most people do not realize it, the VR on this lens does not work in macro mode. The Nikkor 105mm doubled as a nice portrait lens on FX cameras before the refresh of the Nikkor 70-200mm f./2.8G VR2 in 2008. The introduction of that lens made the 105mm redundant except for use as a macro. Nikon has introduced two affordably priced DX macro lenses—the 85mm f/3.5 G DX ED VR Micro Lens and the 40mm f./2.8 micro lens. However, in the category of quality FX macro lenses, Nikon is lacking. This is why the third Nikkor lens on this list of lenses most in need of a refresh is the Nikkor 200mm f/4.0 D ED-IF AF Micro-Nikkor Lens which was introduced before 2005. It is the only Nikon competitor to the Sigma APO Macro 180mm F2.8 EX DG OS HSM which came out in 2012. Unfortunately, in this case the Nikon lens does not even come close to the quality of the Sigma and they are priced the same at about $1600. The Sigma 180mm f./2.8 macro is very impressive and began a run of high quality professional lenses from that company that are causing trouble for Nikon. 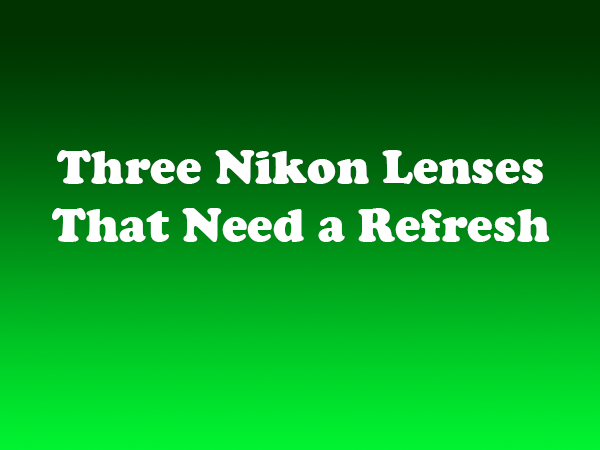 Perhaps a much needed refresh of any one of the three lenses on this list could restore some of Nikon’s lost lens revenue and keep Nikon owners with Nikon lenses. Click the following link to see my review of Top Nikon Lens Releases of 2013. Thank you for this valuable information. I usually buy Nikon lenses. I noticed that Sigma lenses are very good, and price is competitive, that I am inclined on buying Sigma next time. I will start looking into Tamron. So yes, you are right. Nikon needs to refresh its lenses. I can think of a few lenses that are much more in need of a refersh. I own the 24-70 and fail to see why VR would be a benefit. I would rather see the optics updated to better resolve the D800/E. I also own the Canon 24-70 II and 5D3 and think the 24-70 is more than sufficient. Same with the 105. It’s optics are outstanding and hold up to any camera body. The variation of maximum aperture is the only bugbear. What is needed is an update to the 105 and 135 f2 lenses.